VCE 3030 - Velux Electric Venting Curb Mount Skylight - Shipping Included! Designed for curb mounted installations, the VCE electric Fresh Air skylight is the ideal daylighting solution for overhead applications. It opens to let in fresh air with the touch of a button and brings in abundant natural light to brighten your home. And if you forget to close it, the VCE also closes automatically in case of rain. All Velux electric venting skylights now have optional factory installed blinds! Pick the type and color when you add to your order! The VCE skylight installs on site-built curbs with slopes between 0° (flat or 0:12) and 60° (20:12). Factory Installed Blind now optional! All Velux electric venting skylights now come with the option of a factory installed blind! These remote controlled blinds are available in either a blackout or light filtering material and in an assortment of colors. Blackout blinds block out 98% of the lights whereas light filtering blinds are translucent, designed to soften the light and eliminate glare. Blackout Blinds – Blocks 98% of the light. Light filtering Blinds – Diffuse the light, reduce glare and offer increased privacy. 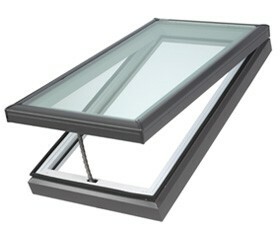 The VCE skylight comes with a pre-installed concealed motor and control system. An integrated rain sensor automatically closes your skylight during rain or inclement weather! The VCE skylight opens and closes quietly from anywhere in the house using our new innovate RF remote control (included).The KLI 110 wall mounted keypad and the KLF 100 interface to home automation systems are also available. The VCE skylight is designed for simple and weathertight installations on site-built curbs. It features factory applied gaskets to seal out wind and water for a weathertight installation. The VCE skylight is constructed with maintenance free white frames and sashes that insulates and strengthens the unit. An insect screen, a stainless steel chain operator and aluminum cladding are also standard.